The company hopes the Zoom Superfly Elite can give its sponsored athletes an edge in Rio. When Shelly-Ann Fraser-Pryce competes in the women's 100m and 4x100m relay at the Olympics this month, she'll do so wearing what Nike claims is one of its most advanced track and field shoes yet. The 29-year-old Jamaican, who is favored for gold in Rio, actually helped Nike design her new spikes, the Zoom Superfly Elite. In the years leading up to the 2016 summer games, she worked with Nike's Sport Research Lab to figure out the ideal performance for a sprinter silhouette. Among other experiments, she test-3D-printed prototypes of the spikes, which were tailor-made based on captured data that measured her speed on the track and, most importantly, off the blocks. More specifically, Nike utilized 3D printing to make a set of different spike plates, each with a different amount of stiffness to meld perfectly with the sprinter's sole. Shane Kohatsu, Nike's innovation design director, says the key here was to understand how the plates rebounded off the track. That information would then be used to build a shoe that helped runners go faster. The optimal model needed to provide the right amount of support as well as withstand all the power exerted during a 100m race. At the same time, though, it had to be lightweight enough for the athlete to feel comfortable. In Fraser-Pryce's case, you wonder why she'd be tempted to use a new shoe at Rio 2016. After all, she's won gold in the women's 100m in the past two summer Olympics. Why fix something that isn't broken? But in a sport where one-tenth of a second could be the difference between silver and gold, any advantage helps. And while the final design of the Zoom Superfly Elite doesn't feature a 3D-printed plate, the research was crucial to develop the plastic version that over 100 Nike-sponsored athletes will wear at the Olympics. After testing more than twenty 3D-printed plates, Nike decided to build the Zoom Superfly Elite without the screw-in spikes traditionally found on a sprinter's footwear. Instead, the company applied fixed pins on the bottom of the plate, which are designed to ensure that the foot is closer to the track. In theory, this should translate to faster speeds for the runner. We'll soon see how that works in practice, when Fraser-Pryce races in the women's 100-meter preliminaries on Aug. 12th. 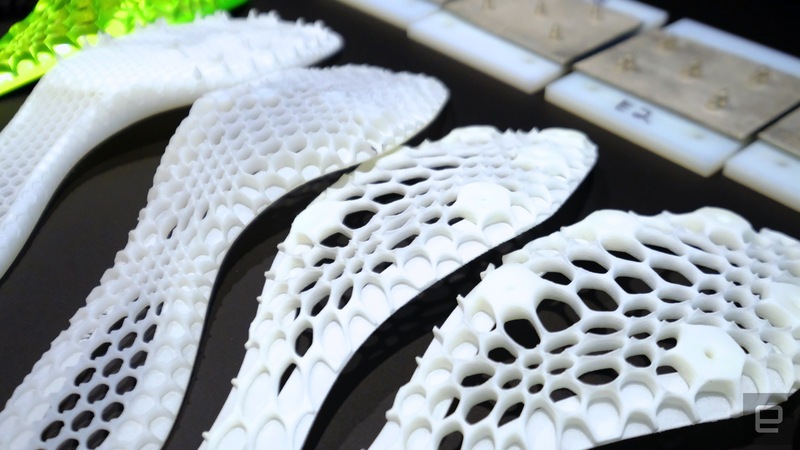 Kohatsu, who has led a number of other 3D-printing projects at Nike, believes in the technology as a tool to make better products, not necessarily as the main aspect of a product. At least not yet. "For us right now, 3D printing is all about accelerating the project, the innovation process," he says. "The 3D printing industry isn't at a place where it can replace mass production techniques. We use it for what it's best at doing, which is accelerating prototyping." 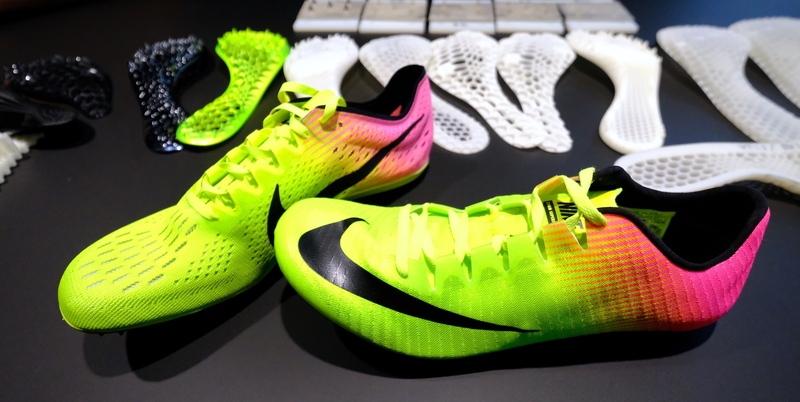 Still, Kohatsu points to Nike's 3D-printed concepts for football cleats, which show the potential of 3D printing. 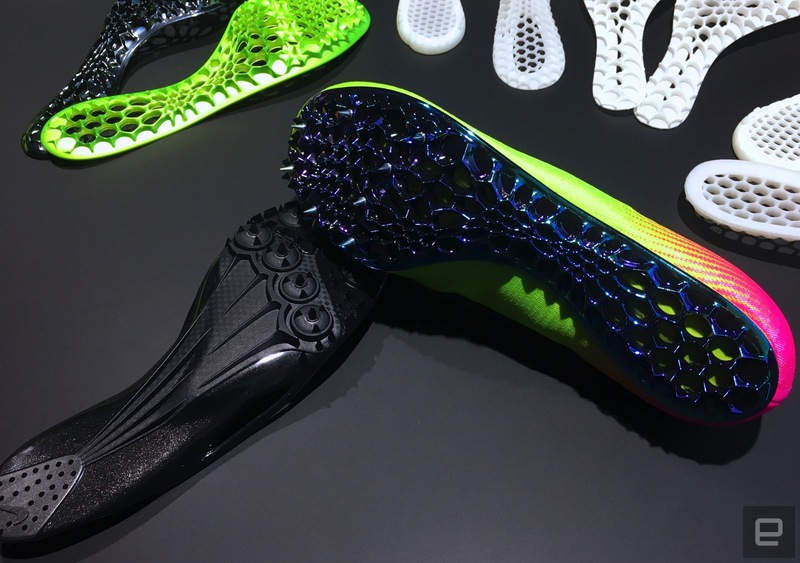 Nike archrival Adidas has also been getting serious about 3D printing in recent months. Earlier this year, the German sportswear giant revealed Futurecraft 3D, a running shoe made with 3D-printed materials. Even though it's only a concept right now, Adidas says a consumer version is in the works. The same goes for brands such as New Balance and Under Armour, which also introduced partially 3D-printed shoes a few months ago. Nike Senior Director of Athlete Innovation Tobie Hatfield, who designed Michael Johnson's iconic gold spike for the 1996 Atlanta Olympics, also doesn't feel like 3D-printed footwear is ready for mass-market production. "We'll 3D-print to have something for them [the athletes] to have in their hand," he says in reference to designing his latest project, the Nike Zoom PV III, a shoe for pole-vaulters. "If the scale is correct, they can put it on and walk around in it, but they're not going to go pole-vault in it. We don't do any of that." Like the Zoom Superfly Elite (which hits stores in October), the Zoom PV III also had 3D-printed prototypes, although the tech wasn't as influential there. That's namely because Hatfield has other machinery he prefers to use to create parts. Ultimately, Kohatsu says it's fascinating that people see 3D printing as "an Easy-Bake Oven," but he doesn't think the technology is quite there yet. Still, he's certain Nike will continue to use 3D printing to help design things like the Zoom Superfly Elite and Magista 2. "If there's some way to make a product that really enhances the benefit for the athlete," he says, "then for sure we'll be diving into that as quickly as possible."